We’ve recently been on holiday to Norway. 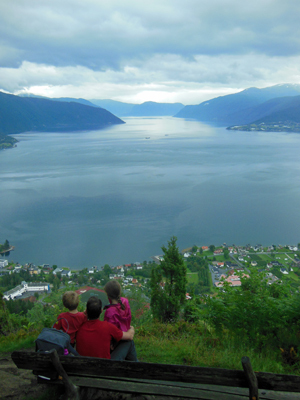 It’s a wonderful country and I could go into detailed raptures about the stunning fjords, the attractive cities of Bergen and Oslo, and how it’s a great place to travel with children, but this is a recipe blog (not a travel one) so I’ll leave that to others. The only downside was that we mainly survived on a diet of bread and economy salami (from the supermarket) because food and drink are so expensive. We did however splash out on strong coffee and the occasional sweet treat. 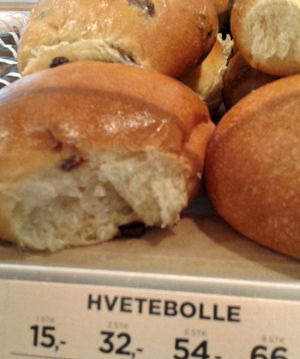 I particularly loved their Hvetebolle – a sweet bun with chocolate and cardamom which you could buy from the 7-Eleven for just £1.20 (each!). Another standout was a delicious chocolate cake with a vanilla and blueberry cheesecake ripple that we had at the Aquarium cafe in Ballestrand. This bought to mind a recipe in my folder of cutouts which I had not yet tried (despite it being there for over 10 years). So this week, with the children back at school and some time to myself, I spent some quality time in the kitchen and made ‘marbled brownies’. They were great and my husband (a man who doesn’t give praise easily) called them ‘seriously delicious’. I’ve had ‘delicious’ before but the ‘seriously’ part was a first! Heat the oven to 160oC (fan assisted) and butter and line a deep baking tin about 20 cm x 30 cm with baking parchment. For the cream cheese, mix all the ingredients together in a bowl until well incorporated and smooth. Set aside. For the brownie mix, first melt the chocolate and butter either in a bowl over a pan of simmering water, or in the microwave (which is what I do). Stir until smooth and leave to cool a little. In another bowl whisk together the caster sugar and eggs, then add the melted butter/chocolate and mix again. Sieve in the flour and fold in gently. To assemble, pour 3/4 of the brownie mix into the tin and spread evenly. 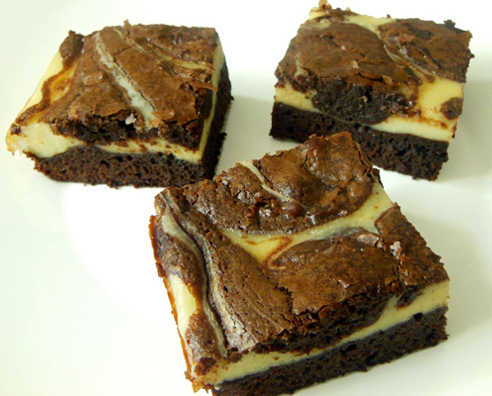 Tip in the cream cheese mixture before spooning over the remaining brownie mix in dollops. Tap the tin sharply on the work surface to level the mixture and then take a skewer and marble the mixtures together using a wave like motion across the tin just once. Bake for 35-45 minutes until just set. Test after 35 minutes with a skewer and if it comes out clean then remove from the oven. Cool in the tin for 15 minutes before cutting into pieces. I can take a week of bread and salami for views like this. 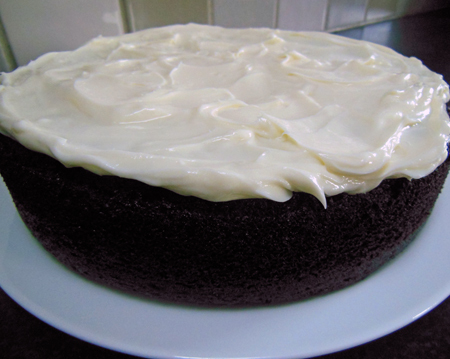 I’ve had more requests for this Chocolate Guinness Cake recipe than any other by a long shot. It’s legendary in our family and is quite simply the best chocolate cake ever. People never believe me when I tell them that it’s super easy to make but it’s true. There’s hardly any mixing involved and limited measuring as you use a whole pat of butter, a whole carton of sour cream etc. Just make sure you buy a good quality spring form cake tin – my original cheapo Tesco one was leaky and it was heart breaking when the runny mixture ended up on the bottom of the oven. You can’t really taste the Guinness (it just adds a malty stickiness) so don’t be put off making it if you’re not a fan. I’m never sure whether the addition of Guinness means that you ought not to give it to children. Surely the alcohol burns off in the oven?! Call me a bad mother but I DO let my children have a slice and they don’t seem to be any more vibrant than usual after a sugary chocolaty fix. The ingredients are pretty expensive (around £6) but you do end up with a large cake which can be cut into at least 12 large slices. I usually end up tinkering with even the best recipe but the only change I’ve made to this one is to leave the double cream out of the icing. It means one less ingredient to buy and I think it tastes fresher with just cream cheese and icing sugar (if you want to keep to the original then you add 125ml double cream after mixing together the cream cheese and icing sugar). The main cake is exactly as Nigella makes it. Preheat the oven to 180oC fan and butter and line a 23cm spring form cake tin. Pour the Guinness into a large wide saucepan, add the butter and heat until the butter has melted. Then whisk in the cocoa and sugar. In a separate bowl beat the sour cream with the eggs and vanilla, then pour into the saucepan with the butter, cocoa and sugar. 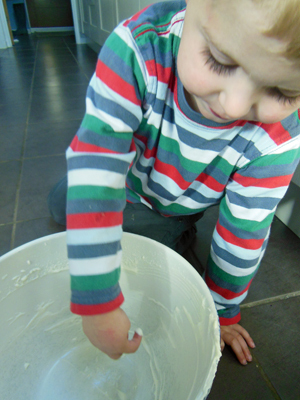 Finally, whisk in the flour and bicarbonate of soda. Pour the cake mixture into the tin and bake for 45 to 1 hour (for me this timing is frustratingly vague – from experience I usually opt for nearer to 45 minutes as it’s better for this cake to be slightly too moist than overdone. I just do the usual skewer test after 45 minutes and if it comes out clean then I take it out then). Leave to cool completely in the tin on a cooling rack. When the cake is cold sit it on a flat plate ready for icing. For the icing, lightly whip the cream cheese until smooth and then add the icing and beat again until incorporated. Put the icing on top of the cake, and distribute roughly so that it looks like the frothy top of a pint of Guinness. 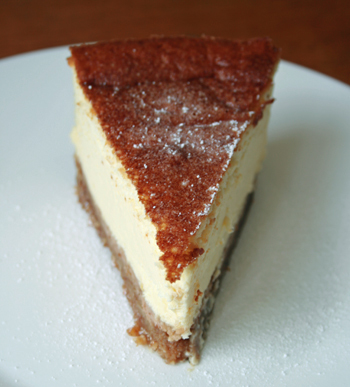 NOTE: Don’t be tempted to use half fat cream cheese for the icing – the lower fat content makes it too runny. I also find that it pays to use branded Philadelphia even though it’s more than double the price. 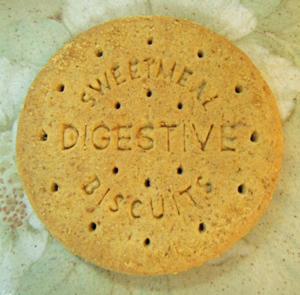 I love digestive biscuits. Admittedly they are a bit boring by themselves but they are so versatile and great topped with sweet or savoury food stuffs or as the biscuit base for all sorts of puddings. When I rooted through my recipe folder I found quite a few digestive based desserts and so these very silly recipes begin my 5 days of 5 ways with digestives. I’m not sure where on earth this idea came from but I used to do this as a child and now my own children just love it. 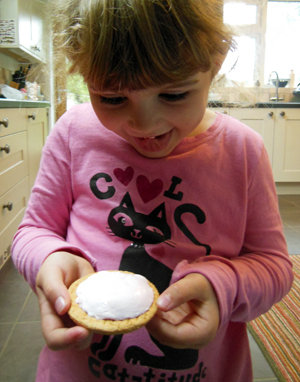 It is pretty exciting watching the marshmallow blow up like a balloon and the end result is a sweet and sticky delight. 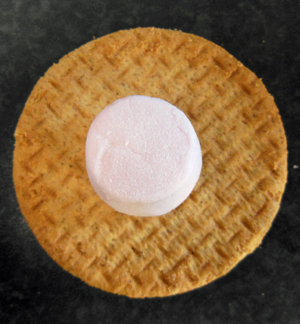 Place a single marshmallow on a digestive biscuit. 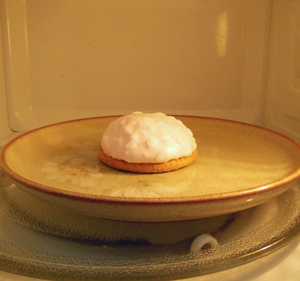 Place in the microwave for 10-20 seconds and watch it blow up like a balloon. 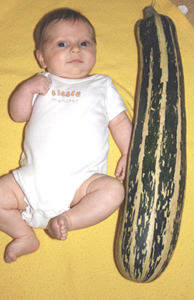 When it is about the same size as the digestive (circumference-wise) stop the cooking. When you take it out it will deflate into a lovely melted gooey mess over the digestive. Leave to cool for a minute before eating. 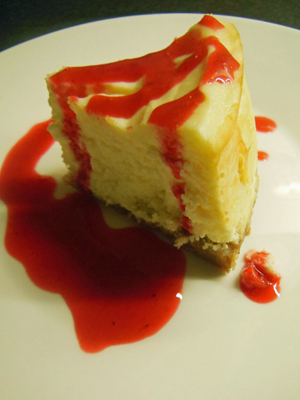 This is for when you really can’t be bothered to make a proper dessert but you need something sweet to end your day. It honestly does taste just like the real thing once it’s all mushed up in your mouth but you obviously couldn’t serve it a dinner party – unless you were trying to be funny. Take a digestive biscuit and smear with cream cheese. Then dollop a spoonful of lemon curd on top. As above but with a dollop of raspberry jam. As above but with a dollop of chocolate spread. I so look forward to the very first courgettes of the season but then, after a month or so when they just keep coming and coming, I scrabble around desperate for new recipes to try. Here are two of my favourite recipes but please do contact me (details on the ‘about me’ page) if you have any other good ones (aside from the usual ratatouille and stuffed courgettes which get a bit tedious). As much as I absolutely hate waste it’s got to the point now where we can’t even give them away. We are currently decorating our garden with some of the larger ones and in past years they have ended up as door stops and baby playthings. Heat the oil in a large saucepan and add the courgettes and garlic. Turn the heat down low. The key here is to sweat the courgettes down slowly (for at least 30 minutes) without browning. The smell at this point is just wonderful. Then pour in the stock and bring to the boil and simmer for a few minutes. I let the mixture cool now for a bit before whizzing up (because I’m prone to liquidiser accidents) but if you’re in a hurry, and you’re careful it’s not really necessary. Pour the mixture into a liquidiser and add the basil. Whizz for about 30 seconds or until smooth. The original recipe recommended a coarse texture but I personally prefer a finer one. I then pour the mixture back into the pan and season well with salt and a little pepper. I don’t add the parmesan until the soup is ready to serve and I stir this in at the end once it’s heated through. I always have it in my head that soup is a little boring (this probably comes from my Dad who has never classed soup as a proper meal) so I like to work the presentation. With this recipe I save a little parmesan to sprinkle over the top and then add a drizzle of good olive oil and a few torn up basil leaves. Any leftover soup keeps well for a couple of days in the fridge as long as you don’t add the parmesan. This recipe was passed to me by a former colleague Glenis. It’s taken from her vast collection of recipes cut out of magazines, I have no idea how old it is or which magazine it came from. I promise that it is much nicer than it sounds. In the past, when I was working, I have taken it into the office and everyone has devoured it (as long as the secret ingredient isn’t disclosed until the end). This is a large cake that should easily divide into 10-12 large pieces. Preheat the oven to 180oC fan, and prepare a 23cm spring form tin by lightly oiling and lining with greaseproof paper. Roast the hazelnuts for 5-10 minutes on a tray in the oven. Watch them carefully to make sure that they don’t burn, you want a golden colour. Remove from the oven and leave to cool in the tray before chopping roughly. Place the sugar, eggs and two oils in a large mixing bowl and whisk until thick (you can do this by hand but it’s really, really hard work so I always use an electric mix). Add the courgettes to the oily, sugary mixture and stir until combined. 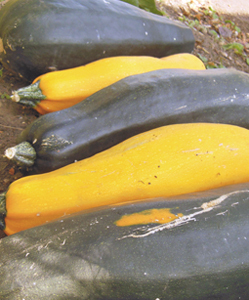 Combine the flour, salt and cinnamon in a bowl and then add to the courgette mixture, folding in very gently. Then fold in the roasted hazelnuts, again use a gentle action here so that you don’t overbeat the mixture. Tip the mixture into the tin and bake for 45 minutes, or until a skewer in the middle of the cake comes out clean. Leave the cake in the tin to cool for 10 minutes on a wire rack. Then remove the cake from the tin and leave to cool completely before icing. The original recipe decorates the cake with ripe peaches before serving but I prefer a more gluttonous, carrot cake style cream cheese topping which I make by mixing a small tub of full fat cream cheese (200g) with an equal amount of icing sugar and a few drops of vanilla essence.